There seems to be a tendency in Azerbaijani families to identify their children's talents very early and then to put great energy into creating a nurturing environment in which they can develop. Ali Jafar, born in 1986, is no exception. He held his first art exhibition when he was six-years-old. It turned out to be a significant event and was covered by the newspapers and Moscow TV. Since then, there have been shows in 1993 and 1995, the last of which was even attended by President Aliyev. Left: Ali Jafar, 10, sketching at his desk. October 1996. 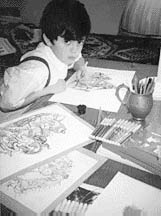 Not long ago, Ali Jafar's parents took him to visit one of Azerbaijan's most famous painters, Rasim Babayev.1 The artist gave the ten-year-old an eraser, thinking it would be a very useful tool for him as he developed his artistic style. But Ali didn't know what the eraser was for. He had never used one in his drawings. "I just don't like doing something over and over. If I don't like something in my work, I quit." His father, an artist himself, first recognized that Ali was uniquely talented when he was two-years-old. "He could draw very fluid, flexible lines. For example, he could start drawing an animal and finish it without lifting his hand. But he couldn't even talk yet. Since I'm also an artist, I was able to notice nuances and subtleties that let me understand that he was talented." Above right: At Ali Jafar's third exhibition in December 1995 at age nine. 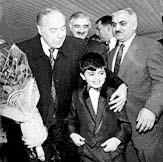 With President Heydar Aliyev (left). Minister of Culture, Polad Bulbul oglu (behind). Baylar Ayubov, Assistant to the President (right). Ali, who is left-handed, is completely self-taught. He has never had any formal instruction and develops on his own. "People have warned us against giving him art classes. It might break him. He might lose his imaginative powers," said his father. His parents perceive that his art is something that flows from inside him. Ali is a very quiet, yet strong-willed individual, according to his mom who says that he used to be rather naughty. "He used to climb up on the roof and in trees, always trying to get away with doing anything that he wanted." The apartment where Ali lives is close to the center of town. It's small. Five people reside there, including Ali's grandmother and his eight-year-old brother, Babak. The living room, which also doubles as a dining room, is filled primarily by a dining table, which is characteristic of so many Azerbaijani homes. Piled high above the china cabinet are scores of Ali's sketches that have been framed and shown in previous exhibitions. A few of them grace the walls, mostly medieval battle scenes filled with horses and soldiers. When Ali works on his sketches, he sits at a little table which is about 18 inches off the floor in the living room. A simple table lamp illuminates his work. Ball point pens and a few felt-tip markers are his only supplies-there are no erasers. A small stack of art books is piled in one corner of the table. The family has reserved this special area for Ali's work; they do everything they can to nurture his talent. The living room also doubles as Ali's bedroom. This arrangement suits everyone best as Ali prefers not to work in the daytime when there is so much activity. Every night around 10 or 11 p.m., he settles down at his table and concentrates on his art. According to his parents, he's very disciplined and draws every night, usually quitting about 2 a.m. in the morning. "Once, I sent him to bed early, but he couldn't sleep," recalls his mother. "I actually found him crying. When I asked him what was wrong, he told me he wanted to draw. I let him get up and work for awhile, and that calmed him down." Some of his sketches might make you think that he is copying from someone else's work, but his creations are all his own. 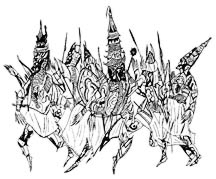 In addition to battle scenes, he is fond of sketching animals-horses, elephants, camels, dinosaurs and mythological birds. Sometimes, he draws them realistically, and sometimes surrealistically. He gets his ideas from movies and television but prefers sketching scenes of the past rather than of the present. He often wonders what animals looked like a million years ago and is always searching through history books to find other artists' depictions of them. Apart from sketching, Ali likes to sculpt clay figurines. So far, he has created the heads of Charlie Chaplin and Buddha. He also likes to visit art galleries. What he doesn't like to do is talk. "You have to pull the words out of him," his mom admits. "But the sketches, well, they just seem to flow." Babayev - front cover (Journeys), AI 6.2 (Summer 1998). Babayev - feature article - AI 3:1 (Spring 1995).